With Easter on the doorstep, everyone is rediscovering eggs. Quite apart from chocolate Easter egg treats, real eggs are favourite brunch staple, whether you like yours fried, poached or scrambled. 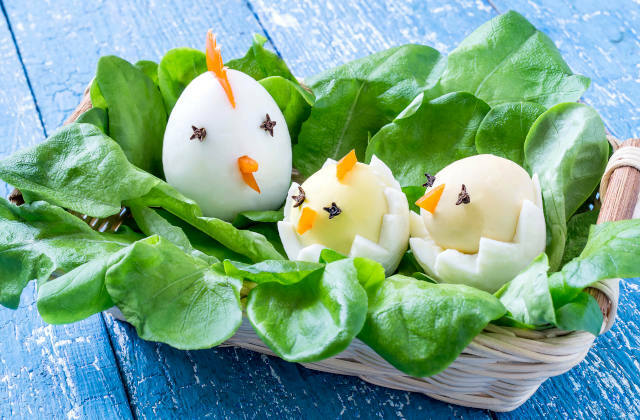 And don’t forget about the daddy of them all – the humble hardboiled egg and the ideal solution for quickie breakfasts and protein snacks, child-friendly Easter craft and traditional sandwich filler. If you’re not sure about how to handle eggs in the kitchen, the experts at Price Kitchens have put together some handy answers to help you get the most out of these little delicious power pellets. Once you’ve bought them, keep your raw eggs in the fridge where they should keep for 3-5 weeks. Once cooked (hard boiled), eggs will last in the fridge for no more than a week. Don’t ever put your eggs in the freezer (cooked or uncooked); it simply doesn’t work. How can you tell the age of an egg? Most commercially bought eggs should have a date printed on them or the box they came in. However, if you’re not sure, here’s a handy way to test the freshness of an egg: Fill a glass of water and add the egg. If it sinks to the bottom of the bowl, it’s perfectly fresh. If one corner lifts up, it’s about a week old and totally fine to eat. If it is standing to a point, it needs using up asap. Eggs that float on top are off – throw away immediately. Another quick test will show you straightaway if your egg is raw or cooked. Place the egg on its side on a kitchen surface and give it a spin. A slow spinning egg is raw, a fast spinning egg is cooked – simples. What’s the best method for hard boiling an egg? Bring a large saucepan of water to the boil, then slowly lower the egg(s) into the water with a large spoon, taking care not to crack the egg. Turn the eat off and leave for 10-15 minutes, depending on the size of the egg. Job done. How do you get easy-peel eggs? For best peeling results, use eggs that are 7-10 days old. Alternatively, you can ‘shock’ the just cooked eggs by rinsing them under cold water once boiled, until the shells are cold to the touch. When the eggs have cooled down, the shell should come off easily. Are grey or green egg yolks safe to eat? Ideally, your freshly hard-boiled eggs should have pale, creamy yellow centres. Green or grey yolks are a sign of overcooking, or leaving them in the water for too long. Luckily, this doesn’t make them unsafe to eat – just not as pleasing to the eye!